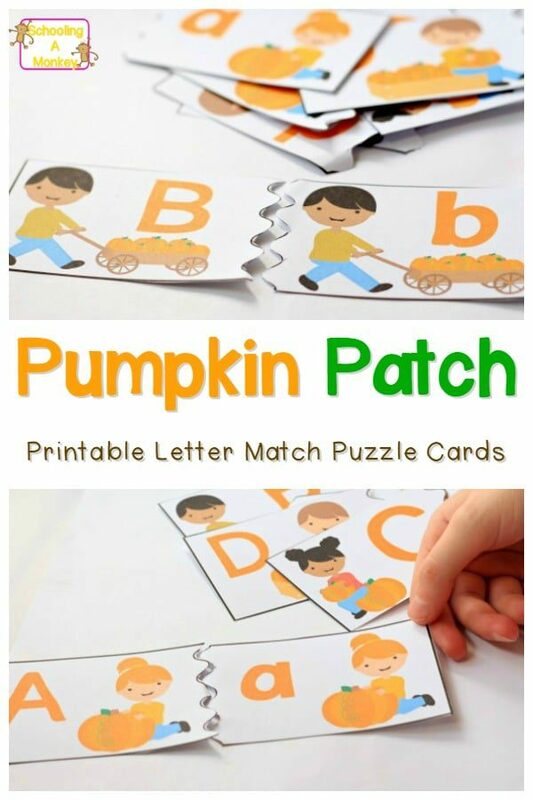 Use these printable pumpkin patch alphabet cards to help children match upper and lowercase letters. 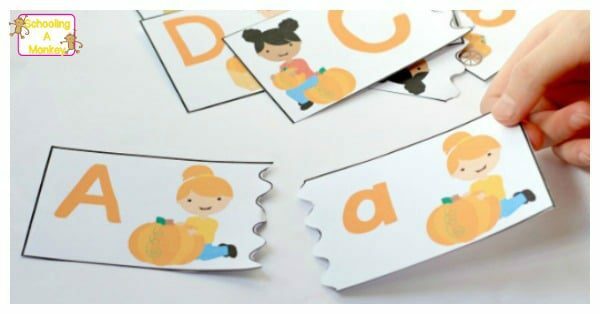 The alphabet match is perfect for literacy centers and makes a wonderful addition to fall thematic units. Now that Bo is in preschool, I’m having all kinds of fun making preschool printables for her. She is not yet ready for traditional worksheets, but we’ve had a lot of fun with printable games and holiday-themed activities. 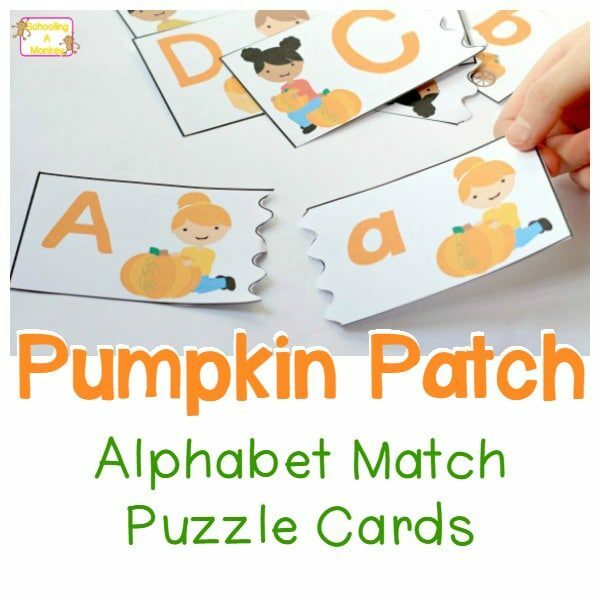 Our latest activity is the pumpkin patch alphabet match puzzle. We had a blast playing this together! This printable set is offered in the Schooling a Monkey Shop. You can also shop at Teachers Pay Teachers. Print the cards onto cardstock paper. Cut them apart with scissors. If you have a laminator, I highly recommend laminating the cards as this will make them much more durable. Show your preschooler or kindergartner how the letters can mean the same thing but look the same. Younger children will find it helpful to look at the pictures to find the correct match. Each corresponding uppercase and lowercase letter has the same picture of a kid in the pumpkin patch. Keep this activity around for when you’re homeschooling older kids, need to keep the kids quiet while you are at a restaurant, or as part of a fall-themed literacy center. We like to store our printable pieces like this in durable zipper pouches like these. The bags make it easy to access all printables and prevents the pieces from getting lost as easily. Use these other fall-themed educational activities as a jumping off point for a fall unit study!